The Unholy Union of Anime and Comics? The event organizers at Reed Exhibitions have confirmed on Thursday that New York Comic Con and New York Anime Festival will share the same weekend and location next year. Both events will take place at the Jacob K. Javits Center in Midtown Manhattan on October 8-10, 2010. While the two events will have separate guest rosters and programming schedules, they will share a common show floor and one ticket price. Each ticket will give an attendee access to both events. 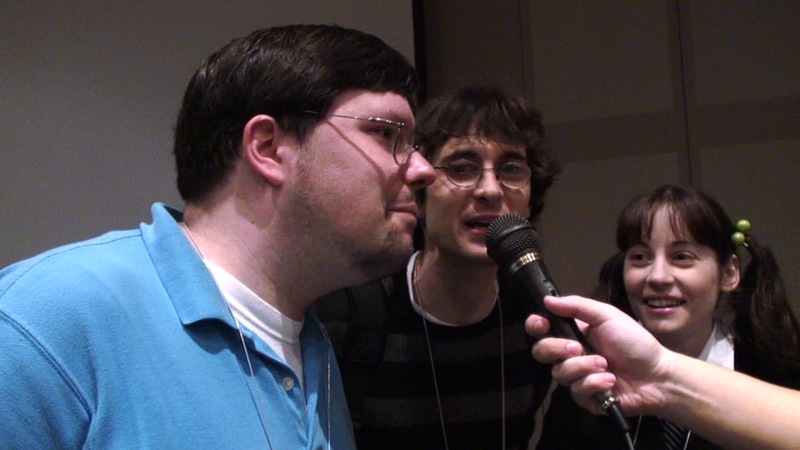 Mike’s Take: I had a great time at New York Anime Festival 2008, which, in my experience, was the best-run convention I’ve attended thus far. It’s no surprise, given that it’s run by a group that actually knows how to run professional exhibitions and, at least when I went, sure knows how to give press a good shot. This news, however, is quite bold and is almost like a big social experiment. Unlike San Diego Comic Con, which this seems to almost be intentionally rivaling, it seems Reed Exhibitions still wants to make a distinction between the anime-related events and the comics-related events. While there’s one dealer hall, and one ticket, everything else is relatively segregated. I’m not sure why they decided to do this: while I know that the fandom for American geek properties and anime/manga overlap less than one might think (based on my Comic Con experiences), SDCC always got by without any separation. Could we see a virtual “war” between otakus and non-otakus, somewhat similar to the divide at this year’s SDCC between Twilight fangirls and the rest of the geeks? 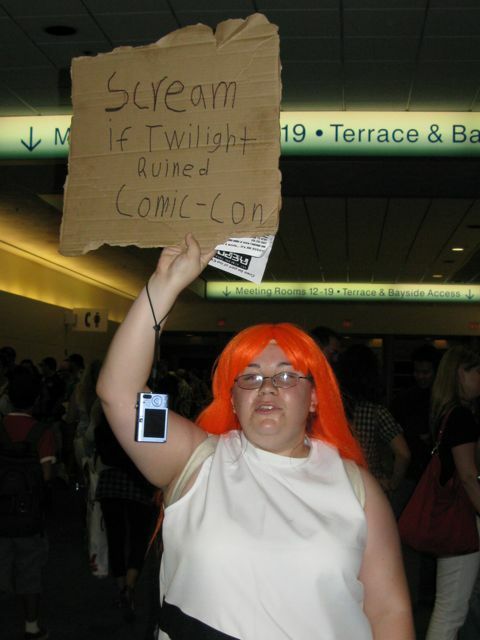 (“Scream if you think Twilight ruined Comic Con!” as a memorable sign put it.) In particular, I’m thinking of competition for large halls and other main events, as well as dealer hall space, which is considerably smaller at Jacob Javits compared to San Diego. In which the blogmen (and woman) cometh; and when Rie comes to town, there’s no stopping the Diet from getting first class footage. I came 5 minutes late due to subway lateness–but thank God for taxis. 11:18 AM: Which role was hardest to play? Lacus Clyne. She didn’t feel the character was quite so realistic, because she’s not so emotional–“not so expressive”–always had to be gentle and nice, with not so much emotional variation. 11:21 AM: So many people are trying to ask questions in Japanese! She just did a Suigintou voice though. 11:21 AM: Rie poses US a question: who plays video games? Practically everyone raises his or her hand. Internet games? Nearly everyone keeps their hand up. “There is no life without video games.” She also asks how do you stop yourself from playing when you have work to do? “Sheer force of will,” one audience member says. Rie giggles, claps her hands. 11:28 AM: Any future roles as Lacus Clyne? She doesn’t know. 11:34 AM: (Her): Who’s a fan of Azumanga Daioh? Chobits? Gundam Seed? The last gets the most cheers. She is also looking for Lacus cosplayers. 11:39 AM: Sing something for us? Which one? Anything? She sings the Lacus song from last night (song #3). This is on tape. She really CAN sing, too. 11:42 AM; More guests. She’s asking to stand up to do rock-paper-scissors. this is for prizes, including cds. I lose round 1. 11:44 AM: Panel over. I didn’t get any questions in. But I do have good footage from the front row. 2:42 PM: still gathering. I see fellow bloggers sitting across from me, they are liveblogging too. I wonder who they are? The camera is all set up and ready. 2:45 PM: a Darker than Black preview trailer is playing now. 2:49 PM: Everyone, not just anime, has had problems with DVD market. Plus Blu-Ray and downloads. Funimation wants to move toward downloads more. 2:52 PM: packaging changes, number of episodes of discs to change. 2:53 PM: Majority of people present are first or second-time congoers! 2:55 PM: Youtube and Funimation partnership: Full episodes of Mushishi, Kiddy Grade, Slayers, and others. 2:57 PM: Hulu.com–subbed episodes of Mushi-shi, Basilisk, Kiddy Grade, etc. 2:58 PM: Paid downloads on funimation.com. 3:01 PM; Funimation’s Podcast. Random unicorns? 3:02 PM: Samurai 7, Vexille in Blu Ray soon. 3:04 PM: Tsubasa S2 finished now. 3:07 PM: Black Lagoon, 2nd Barrage (Geneon rescue). S1 to be released soon. LE tin box can hold all discs of S2. 3:13 PM: Ghost Hunt 1-13. Trailer playing. 3:18 PM; Negima!? OVA “It’s Akamatsu, what do you expect?” Well, fan-service….lots of it in the trailer. 3:22 PM: Ouran Host Club. “Screaming, awwing, squeeing…” Oct 28th, Jan 6th for parts 1 and 2 of the whole series. To be sold early at Anime USA (in DC). I don’t like the dub voice for Tamaki. Haruhi sounds about what I imagined though. 3:25 PM: Afro Samurai Resurrection (to many cheers. “Show us some violence now!” I saw the trailer at Comic Con at the Afro Samurai panel. 3:28 PM: Darker than Black, Vol. 1 (Nov 25th). Trailer line: “The world is faced with atonement?” eh? 3:32 PM: NEW LICENSE: Mushi-shi live action movie. Available 2009. 3:33 PM: Q&A. That’s it for me. Here’s the schedule breakdown for our NYAF coverage this weekend. 1:30 PM–2:30 PM: Bandai Industry Panel (?? ): I will try to go, by this one is in jeopardy because the bus may arrive late and I may not be able to get to the convention center on time. Hopefully I will at least catch some licensing announcements. 2:45 PM–3:45 PM: Funimation Industry Panel: the new masters of the US anime industry say they have licensed even more stuff. Let’s find out. 8:30 PM–10:00 PM: MC Chris Concert: MC Chris is one of those ‘nerdcore’ rappers who raps about geeky subjects, and is a guest of honor here. Not entirely anime related, I know, but I’m going since my VIP ticket gets me in for free to it. 12:30 PM–1:30 PM: Anime Blogger Panel: for me, personally, this is going to be the highlight of the con. I will be the one with a cameraman and a tripod, and I plan to shoot the entire panel in HD! 7:00 PM–10:00 PM: Masquerade: of course. And since I get to skip lines I hope to get a good seat and therefore good shots this time! 11:00 AM–12:00 PM: Rie Tanaka Panel: Ray and I have prepared questions we’ll try to ask Tanaka-san at the panel. Let’s see if any footage is allowed. 12:30 PM-1:30 PM: Rie Tanaka Signing: The main reason Ray paid me to get that VIP ticket! 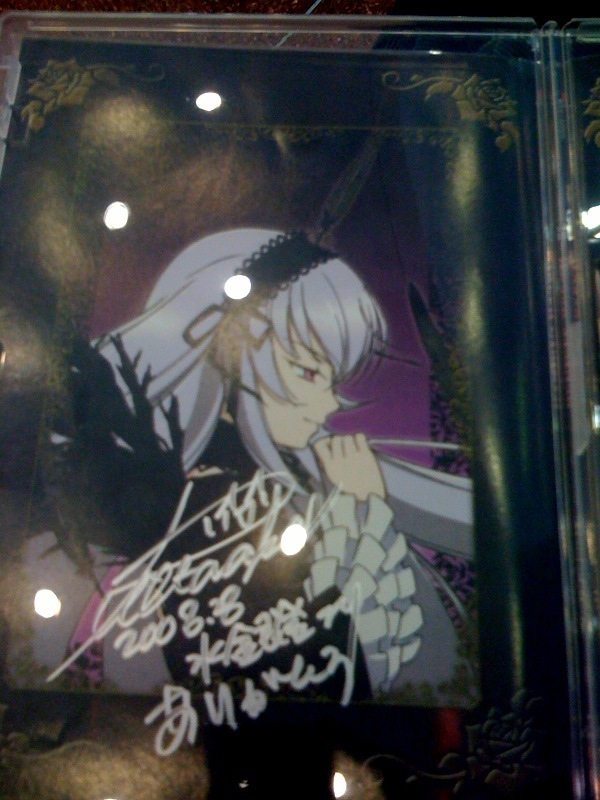 Again, we’ll see what’s allowed to be signed and whether I can get a picture in at least, like I did with Shokotan. That’s the plan. Of course, cons being cons, timing and events are subject to change. I may go to more or less events depending on time. Anime Diet @ New York Anime Festival! Through a very convenient confluence of events–namely the time which I usually go home to visit my folks–I (Mike: yes, me, not a surrogate) will be attending the New York Anime Festival this year! I am also the holder of a VIP Rie Tanaka ticket, which means I’ll be getting a signing from her–as well as the right to skip most lines. Like every other con I’ve attended, it’s getting the full treatment: liveblogs, video journals (in HD this time!–thanks to my cameraman), and photos. This also gives me the chance to attend Hinano, JPMeyer and DS’s blogger panel, something I never expected to be able to go to. Having met CalAggie and IcyStorm this year at our panel at AX, it’ll be great to put more faces to the names of my esteemed colleagues in anime blogging.